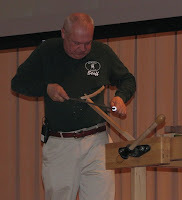 Mike Dunbar's name is synonymous with Windsor chairmaking so it's no wonder that he taught the seminar at the WIA conference on Mastering the Drawknife & Spokeshave—tw o handtools that figure prominently in making Windsor chairs. The drawknife is a workhorse meant to remove stock very quickly. Mike skewed the blade, starting at one end and sliced toward him to the other end of the blade, in quick action as he removed large pieces of wood from his workpiece. The drawknife is used flat-side-down and has handles that are slightly lower than the blade. The bevel (or bezel), is curved, not flat, and definitely not concave (as in hollow grinding). Because of this, you sharpen the blade with a stone or with 220 grit sandpaper wrapped around a hardwood block (drawknives don't need to be as sharp as chisels and plane irons) and work along the entire surface of the bevel, not just the cutting edge, so you maintain the same angle. Mike didn't know the bevel angle (maybe 25º) but it is shown in the third photo. Shaving horses are quaint, Mike said, but he prefers a bench vise. Vises allow you to work the entire way around a workpiece without removing and repositioning it and work with very long pieces. Antique drawknives, according to Mike, are best prior to 1900, when manufacturers changed the shape of the bevel to either a flat or thumbnail shape. After 1900, he says, "Don't buy them." 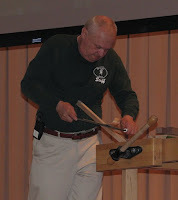 However, you can purchase new, correctly-shaped drawknives from Mike's website. 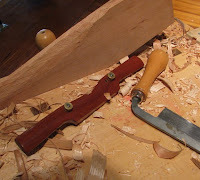 Conversely, spokeshaves are delicate creatures that are meant to be held lightly between your first two or three fing ers and with thumbs directly behind the blade (on the push stroke). Mike uses spokeshaves from Dave's Shaves and Woodjoy, and suggests avoiding metal-bodied ones because they produce more chatter. To sharpen, Mike laps the flat side first and then uses something like this , a rotating disc of tempered glass with adhesive 600 grit sandpaper applied to it, to sharpen the bevel. Spokeshaves come in a variety of shapes—flat, curved, and small soles—and can be used on either the push or pull stroke. If you are experiencing a lot of chatter, check that your workpiece is secured tightly or check the wood structure. 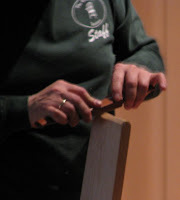 Wood with alternating tight and open grain can produce a washboard effect, so you need to skew the blade as you shave. To work a concave shape, shave down into the valley from both sides and lift up as you reach the bottom of the cut. 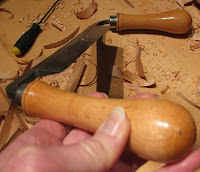 Spokeshaves can be used to shape cabriole legs, or virtually any shape, and the facets can be removed with files or sandpaper. Mike's advice is to "Play with the tools. Don't wait to get to know them while you're working on a project." And my advice is "Any reason to play in your shop is a good one." So....thanks, Mike! The information above is from notes I took at Mike Dunbar's seminar. I have never used drawknives. I do, however, use 3 metal-bodied spokeshaves (Lee Valley) that I like very well.